On 7 and 8 March 2019, the Second Mutual Learning Workshop of GENDERACTION took place in the premises of the Austrian Federal Ministry of Education, Science and Research in Vienna with 36 participants from 14 countries. The aim of the workshop is for participants to become familiar with the concept of monitoring and its relevance for policy development and implementation (improvement of policies, efficient use of resources). 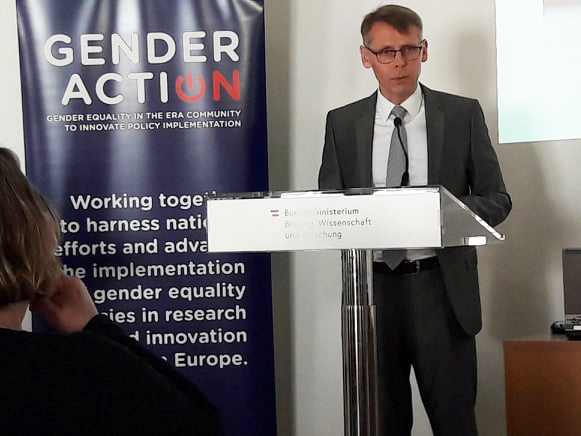 After opening words by Iris Rauskala from the Austrian Federal Ministry of Education, Science and Research and an overview on the current state of GENDERACTION by project coordinator Marcela Linková, ERAC co-chair Christian Naczinsky outlined future perspectives for gender equality policies in ERA. Angela Wroblewski gave an introduction to monitoring which focused on the purpose and general principles of monitoring as well as different approaches to monitoring for NAP implementation. Three examples of national monitoring systems complemented this general introduction. 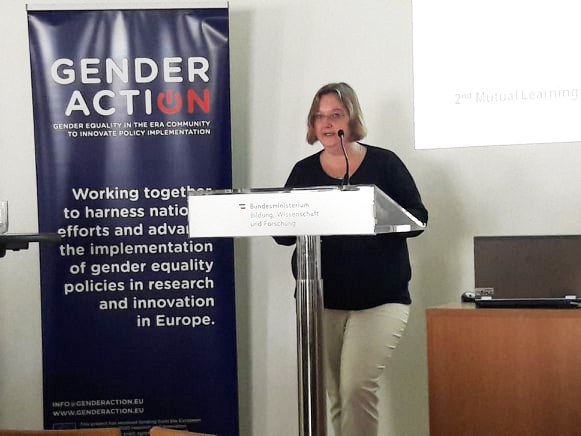 Heidi Holt Zachariassen and Lise Christensen presented the Norwegian experiences with monitoring NAP implementation regarding the gender dimension in research content. Capitolina Díaz Martínez described the status quo of monitoring gender equality in R&I in Spain. Finally, Bernhard Koch and Peter Koller introduced the Austrian ERA Progress Report which focuses on the implementation of policies mentioned in the Austrian NAP. During the workshop different approaches to monitoring of NAP implementation were presented. The general discussion was complemented by examples of national monitoring systems (Norway, Spain and Austria). For each of the approaches concrete indicators were presented and the pros and cons for each approach were discussed. Furthermore, participants discussed possibilities for using indicators as steering instruments as well as possibilities for linking the different levels of monitoring, in order to strengthen national gender equality policies. The results of the workshop – especially the assessment of the proposed set of indicators for monitoring NAP implementation – will feed into the second report of WP3 within GENDERACTION which will assess NAP implementation. 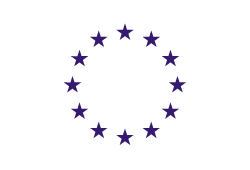 The report will be available in Autumn 2019.